Source of Hope School opened its doors in July, 2006, in the town of Zapote, a remote area where food, work, and education are scarce. Rural areas like these are rife with child abuse, neglect, and forced child labor. In a partnership between Kids Alive and Iglesia Galilea, a local church, the ministry began with 40 preschoolers and now has 220 children during the week. And on the weekend, higher education programs and technical classes are offered to graduates. Children at Source of Hope receive a solid education, health services, and a nutrition-based meal program – often the only real meals they receive each day. In addition to meeting physical and academic needs, a key focus is sharing the good news of Jesus Christ with each child. This location is a wonderful place for Service Teams and missionaries to visit. God is at work in the village of Zapote, where poverty, poor health, unemployment, and abuse are all major problems. 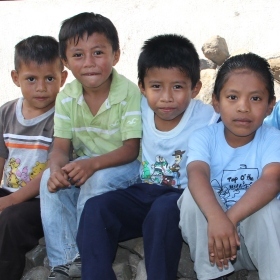 Kids Alive and Iglesia Galilea are working to extend our impact in the community through nutrition, micro-business, education, and discipleship programs for children and their parents. We firmly believe that the Gospel can transform this village! Support the Ministry of Source of Hope School with Your Gift Today.